What would you do if your Dad died ? but came back as a zombie? This is one of the many questions faced by Cinderella in the bizarre fantasy land Junko Mizuno has created for her. This isn't your Grandma's fairy tale, though, as Mizuno combines pop art and the grotesque, with a sardonic sense of humor. 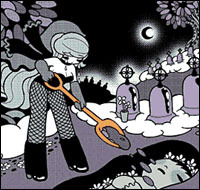 If I could describe Junko Mizuno's Cinderella in one phrase it would be "head trip." It has been two days since I first read Viz's screener copy and I still can't make heads or tails of it. The series features a sharp, modern pop art style and a distinct edginess. Viz is planning on releasing the quirky series in a 120 page full color novel. This will mark Mizuno's English language book debut. 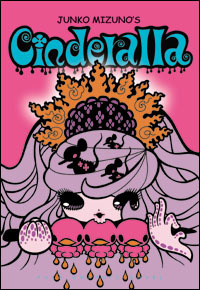 However, Cinderella has been previously serialized in PULP: The Manga Magazine. In Mizuno's retelling of the classic tale of Cinderella, Cinderella works in a yakitori restaurant, the princess' stepsisters are zombies, and canary is good eating. Viz has described the manga as "Powerpuff Girls on acid" and having a "grotesque edge." Both descriptions are true. Drawing in a thick lined, simplistic way, Mizuno's Cinderella recalls the both the Powerpuff Girls and chibi anime. Mizuno combines this retro drawing style with a pastel palette. This super cute art style is contrasted with the sheer bizarreness of the imagery everything from Cinderella making bra for her zombie step sister (how many times will you get to say that in your life?) to Cinderella's mouse friend, Setsuko, growing to enormous proportions combines the two ideals, creating surreal imagery. The grotesque comes in many other instances the manga's yakitori looks like shish kabob canary - there are few things more bizarre than seeing Cinderella daintily chewing on a birdie's head. Viz has done a good job translating Mizuno's series. Kanji in the comic's art remains, while the Japanese onomatopoeia in the text has been translated into English equivalents. Viz's choice to release is a no-brainer, though it would have been all too easy to release the manga in black and white. The first volume of Cinderella is peppered with such events as the death of Cinderella's yakitori restaurant owning dad (and his subsequent rise from the dead as a green zombie), and his hooking up with a zombie woman, who has two shapely zombie daughters. And of course, there's always the requisite toplessness. Mizuno, born in 1973 in Tokyo, is known for her CD booklets on Avex's Pure Trance and her book Hell Babies. Her pop illustrations have become very popular in Japan, emblazed on everything from t-shirts to skateboards to nightclubs. Her comics have appeared in Tokion magazine, Secret Comics Japan, and PULP, in which she illustrated the "Vulgarity Drifting Diary" column. A full list of Mizuno's work can be found here. Will Cinderella find the same successes here? It's hard to say if the Powerpuff Girls art will jive with the jarringly grotesque themes, but if you're interested the $15.95 (U.S.) book is a great way to sample Mizuno's creativity. A better question is, is America ready for Junko Mizuno? That is a more difficult question to answer. In any case, I guarantee you won't be quite the same after reading Cinderella.